Give your lawn a breather! Your grass is a plant – one, continuous stretch of green, so it may be easy to forget this fact since it’s not in a pot or a landscape bed, but grass is a plant. And like any plant, it’s roots need oxygen to thrive. Normal foot traffic, daily activities, even pounding rain, can cause soil to become compact and tight. This make it difficult for oxygen, water and nutrients to reach a lawn’s roots. There is good news – ProLawn has the simple solution – Core Aeration. 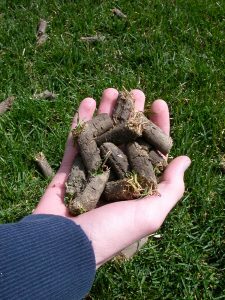 Core Aeration opens up the soil by extracting core plugs from the soil, allowing oxygen, water, and nutrients to reach the roots. Core aeration also breaks down damaging thatch. In fact, some experts claim it’s the single most important thing a homeowner can do for their lawn! this…enough said!?! But not to worry, the rain washes them away! 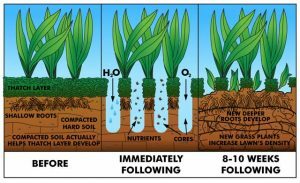 Now is the time to contact us to schedule your core aeration. ProLawn is looking forward to providing a green, thick healthy lawn that you and your family will enjoy. Call today to schedule your core aeration @ 54.662.8316 or 800.776.5296. *Broadcast seeding at the time of Core Aeration is highly recommended. Look for a separate blog on Broadcast Seeding!